Riding on generous government incentives, Thailand's energy firms are deepening a push into solar power to bolster their profits over the next few years and perk up lacklustre shares. Utility Electricity Generating Pcl (EGCO) and refiner Bangchak Petroleum Pcl are among a dozen listed Thai companies investing as much as US$2bil combined in solar projects over the next five years to provide power to South-East Asia's second-largest economy. The government, spooked by spikes in fossil fuel prices, is buying electricity from solar power producers at prices up to two times those charged by conventional power suppliers. Still, the longevity of those premium prices remains to be seen, as energy policies can change in Thailand's often volatile political climate, some analysts say. SPCG, Thailand's largest solar farm, will make a net profit of 10 million baht (US$319,400) per megawatt this year, at least four times that of traditional power producers who will make 1.2-2.5 million baht per megawatt, industry analysts say. "Solar is hot," SPCG CEO Wandee Khunchornyakong said. "It's undeniable that everyone wants to enter this business." Bangchak Petroleum reported results on Thursday that showed the solar business was its fastest-growing segment in terms of profitability, accounting for 15% of its core quarterly profit of 2.6 billion baht. Earnings of the business jumped 150% year-on-year. 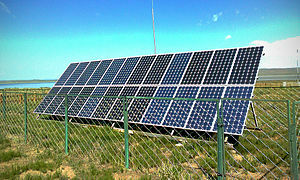 Bangchak, part of state-controlled PTT Pcl, is raising its solar capacity to 169 megawatts by next year from 94MW in 2013. It has plans to boost that to 500MW by 2020. EGCO, whose affiliate won licences in October to put up solar-powered rooftops, is looking to buy solar farm licences as part of plans to expand into the renewables business. "The government has made it very attractive to enter the sector now," said Itphong Saengtubtim, analyst at KGI Securities. "But for solar farms, there are some risks as we don't know when the government will issue more new licences. And going forward, return on investment for the future projects could be lower because the government may not offer high rates to buy solar power as it is offering now." With oil imports hitting a record US$38bil last year, or 9.3% of GDP, Thailand unveiled a plan this year to triple its solar power capacity to 3,000MW by 2021. Renewable energy is expected to account for a quarter of Thailand's energy mix by 2021 from 8% now, of which about a fifth will come from solar power. It launched a project in September encouraging households and factories to install solar photovoltaic panels on their roofs and sell power to the state. They are being offered nearly 7 baht per kilowatt-hour for their power, against the 4 baht per kWh that has been contracted this year for electricity generated by gas-fired power stations. Bangchak, EGCO and other solar power producers are already being paid up to 8 baht per kWh for the 1,445 MW they have contracted to sell to the state grid, of which the companies have supplied a third so far. The government says the extra paid for solar power would still be less than what new power from conventional sources could cost with the increases in oil and gas prices. Company executives are confident new projects coming online will lift near-term profits. "The third phase solar farm will start its commercial run in the second quarter next year, which should boost revenue by 1.2 billion baht a year," Bangchak President Vichien Usanachote said about a US$144mil solar farm that is under construction in Thailand's east and northeast provinces. SPCG and EGCO will report quarterly financial results on Nov 11 and Nov 12, respectively. By providing a source of new and stable profits, the solar push could offer a lift to Thai energy sector shares. Utility shares in the Thomson Reuters Thailand Index are down nearly 5% this year on average compared to the 1% gain on the main stock market index. There have, however, been related winners. Rising demand for solar energy has boosted sales for domestic panel makers such as Solartron Pcl, whose shares have almost doubled in 2013. Global solar panel suppliers such as Kyocera Corp and China's Suntec Power Holdings Co Ltd want in on the action in Thailand as they seek to lift sales volumes to make up for weak prices owing to global oversupply. "People are not just getting into the business out of love for the environment," said Syed Azmin Al Bukhary, chairman of Malaysia's Sun + Lite & Power, which bought a German solar panel maker and wants to sell the products in Thailand. "There is good money to be made here across the industry and Thailand is the sweet spot, for now," he added.